This article features one of our clients, the J. Gibson McIlvain company. Visit them online at www.mcilvain.com or call them toll free at (800) 638-9100. Genuine Mahogany (Swietenia macrophylla) deserves every bit of its popularity as both an interior and exterior species. Grown in Central and South America, the term “Genuine” distinguishes it from lesser species (that are still true Mahoganies) grown in Africa or Asia. Due to decreased supply, African species are becoming increasingly prevalent options, but Genuine Mahogany remains a sought-after species — and for good reasons. 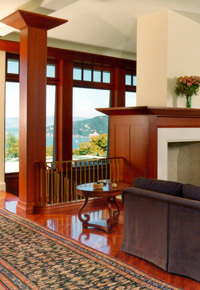 As woodworkers and builders know, Genuine Mahogany is ideal for machining, carving, and planing. Traditionally used for furniture and cabinetry, this wood has recently become popular as an exterior species, particularly used by door and window manufacturers. With its rot resistance and gorgeous, deep color, it’s no wonder that this species is highly prized. Unfortunately, South American Mahogany forests have not always been managed as responsibly as they are today. Sustainability is now regulated by CITES, limiting the amount that can be exported. The good news is that such measures give us hope of the future health of the Mahogany forests and long-term availability of this amazing species. The bad news is that greater political involvement and subsidies have led to poor sawing practices. The unfortunate result of such practices includes a higher net loss and poorer overall grade. Due to the changes in the Genuine Mahogany being produced, the North American market can’t afford to be as picky as it’s been. Expecting perfect grades of tropical woods is simply not reasonable: After all, we’re talking about a natural building material here, not plastic. By failing to accept a wider range of grades, we’ve actually contributed to the problem. 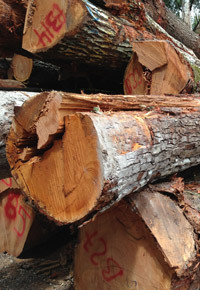 Requiring “defect-free” wood means rejecting a lot of great lumber, and increased prices and decreased availability will be the natural result. Organizations in South America are attempting to “solve” the problem by applying NHLA grading standards toward tropical forest woods. 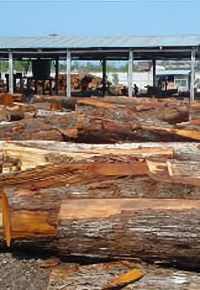 If NHLA grading standards are implemented for Genuine Mahogany and other tropical hardwood lumber species, more defects would be allowed into each board, which in theory would give more beautiful and durable Genuine Mahogany lumber a home. While that change may sound positive, it’s key to remember that the NHLA grading system is more geared toward the furniture industry, and not toward milling — which requires long defect-free boards. While Genuine Mahogany used to be primarily used in furniture construction, most of it is now used for milling, and the boards required for this are of the best quality. With the NHLA grading system welcoming lower quality boards, the net result for the moulded product industry will be many more unusable Genuine Mahogany boards passed off as FAS (Firsts & Seconds) that will simply be wasted, when they’d be better off remaining part of the forest. However, it’s a tragedy all around for that lumber to be cut and exported as FAS and then wasted. Only time will tell what the future holds for Genuine Mahogany. 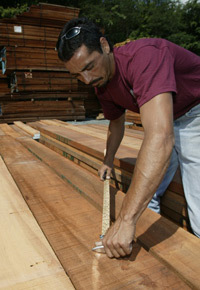 At J.Gibson McIlvain, we keep a significant inventory of Genuine Mahogany in stock, in a variety of lengths, widths, and thicknesses. We even keep extremely wide boards (in the 20 to 35” range) in stock for those specialty applications. Whether you’re still seeking high-quality Genuine Mahogany or are willing to consider premium grades of comparable species, J.Gibson McIlvain is your source.